Remember your blessings, in other words, and the emptiness you’d feel if you didn’t have them. But don’t stop there. Remember also why you received those blessings to begin with; remember they come with an obligation; and consider what life expects you to do with them. A lot of people think God’s blessings are given to make life better for them or to reward right living. I believe God wants to fill our lives with blessings and is already doing so; all we have to do is ask for them. “Ask, and it will be given to you,” Jesus said (Matt. 7:7). A lot of people ask God to bless them, and God does, and they are grateful, like Jabez. Do you know Jabez? Fifteen years ago Bruce Wilkinson wrote a little book that focused on how God blesses us if we ask. It was called The Prayer of Jabez, and it was based on an obscure passage in the Hebrew scriptures about a man who appears nowhere else in the Bible. We know almost nothing about him except that he offered a short prayer to God. Jabez called on the God of Israel, saying, “Oh that you would bless me and enlarge my border, and that your hand might be with me, and that you would keep me from hurt and harm!” And God granted what he asked (1 Chron. 4:10). A lot of people started praying that little prayer. They made it a big prayer in their lives and prayed it faithfully and even reported being blessed because of it. The Prayer of Jabez became such a hit, I think, because it fit so well into America’s culture of individualism, a culture that has worked its way deep into our faith. Many of us think faith is a private thing, something having to do with a personal relationship with God. We believe the words of an old hymn are about our personal stake in heaven: “When the saved of earth shall gather over on the other shore, / And the roll is called up yonder, I’ll be there.” I’ve got my blessings and my place in heaven; do you have yours? Frankly, it’s hard for me to imagine a more self-centered prayer or one that’s more contrary to the gospel of Christ. In one short prayer of four simple petitions, Jabez uses the word “me” or “my” four times. The prayer is all about Jabez and the blessings he hopes to obtain from God. There’s not a single word or thought about anyone else. During my last eight Ruminations I mused about the blessings Jesus talks about in the Beatitudes, eight keys to living abundantly (Matt. 5:1-12). 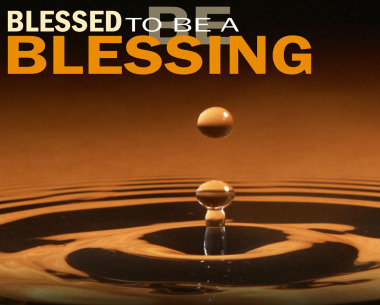 They are blessings for our situations in life, situations like spiritual poverty, grief, and persecution for our faith. They are also blessings for conditions we might aspire to reach: blessings for the meek, the pure in heart, peacemakers. Those blessings fill our needs so well, it’s easy to think they might be meant for us, like answers to the prayer of Jabez. “Bless me,” we pray, and so God blesses us. Well Jabez, it’s time you met Jesus. Jesus knew about blessings so abundant, we can give thanks for them in every circumstance (1 Thess. 5:18). Jesus also knew why God’s blessings are given to us, a reason that goes back to the roots of our faith, before there were Jews, before Abraham was Abraham. “I will make of you a great nation,” God promised Abram, “and I will bless you, and make your name great, so that you will be a blessing” (Gen. 12:2). I will bless you so that you will be a blessing. The reason why God blesses us is not for our benefit but so that we will be a blessing to others. God invests blessings in us so that they will pay dividends for those around us. St. Paul learned that lesson in his suffering. God “comforts us in all our troubles,” he wrote, “so that we can comfort others” (2 Cor. 1:4 NLT). When you feel spiritually impoverished, are you blessed with heavenly riches (Matt 5:3)? That’s so you can enrich others who are spiritually poor. In your grief, are you blessed with a deep comfort (Matt. 5:4)? That’s so you can use your experience to comfort others. Are you blessed with financial resources greater than you need for a modest quality of life? That’s so your abundance can fill the need of someone who has too little (2 Cor. 8:12-15). In Jesus’ description of the Last Judgment (Matt. 25:31-46), it’s not individuals who are blessed or called to account for their way of living; it’s nations (v. 32). We’re in this life together, and we live or perish together, not as individuals, but as communities. And the final evaluation of our lives will be based on how well we did together at caring for others: feeding the hungry, satisfying the thirsty, offering hospitality to the alien, clothing the naked, being present to those who would otherwise be left out. There’s a fable about a little girl who was feeling lonely and blue when she happened across a gorgeous butterfly trapped in the thorns of a blackberry bush. Taking great care not to tear its fragile wings, the girl set the insect free, whereupon, instead of fluttering away, it turned into a golden fairy who offered to grant any wish. “I want to be happy!” the little girl asked. The fairy smiled, leaned forward, whispered something in her ear, and vanished. From that day on there was no happier person in the land than that child, who grew into a contented old woman. On her deathbed, her neighbors crowded around, desperate to know the secret of her happiness. “Tell us, please tell us, what the fairy said to you,” they pleaded. We don’t live abundantly because we’ve been blessed; we live abundantly because we’re a blessing to others who need us and what we’ve been given. A spiritual gift, a skill or talent, a way of encouraging others, a way of building up relationships, a gift of financial resources – these are keys that unlock the door to living abundantly. And we unlock that door when we freely share our blessings, whatever they are, with neighbors who need them.